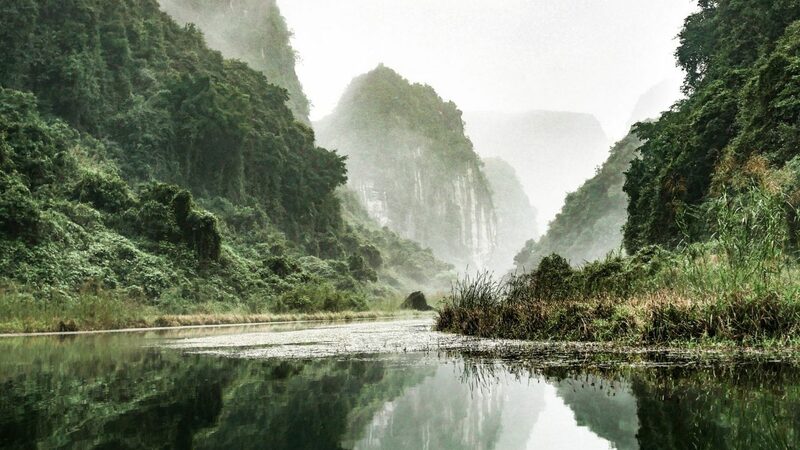 Since Ninh Binh was the filming location for the famous movie ‘Kong: Skull Island’, it’s such an unnecessary thing to mention how beautiful and dramatic the landscape of Ninh Binh are. Recognized by UNESCO as a natural AND cultural world heritage, Ninh Binh is a place where the drastic beauties of karst formations meet the idyll of floating paddy fields and visitors must go on an expedition to visit the well-hidden and sacred temples. With immense beauties in culture and nature, there’re a lot of things to do in Ninh Binh Vietnam, of which some shouldn’t be missed such as boat ride, caving and visit Bai Dinh pagoda. Our article will show you in details what to do for your trip to Ninh Binh and how to get the most of it. You want to produce eye-popping pictures for your Instagram posts? 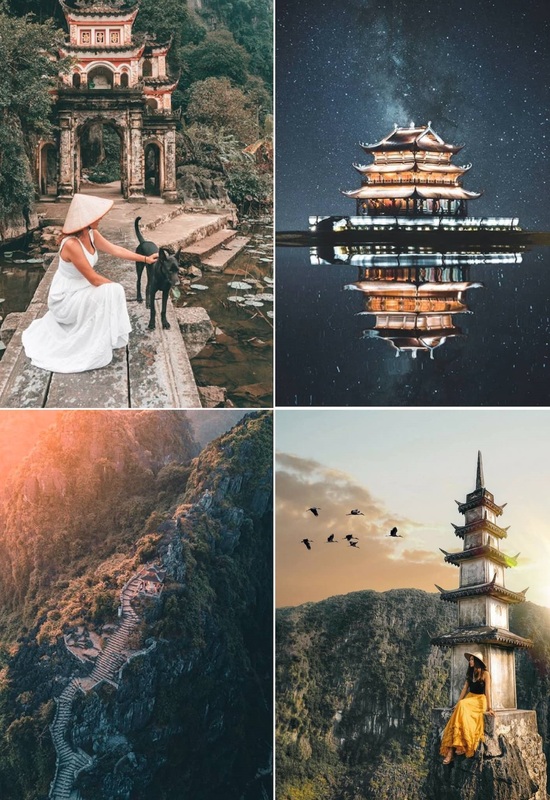 Ninh Binh is no doubt will be the hottest Vietnam destination in 2019! Look at these masterpieces! 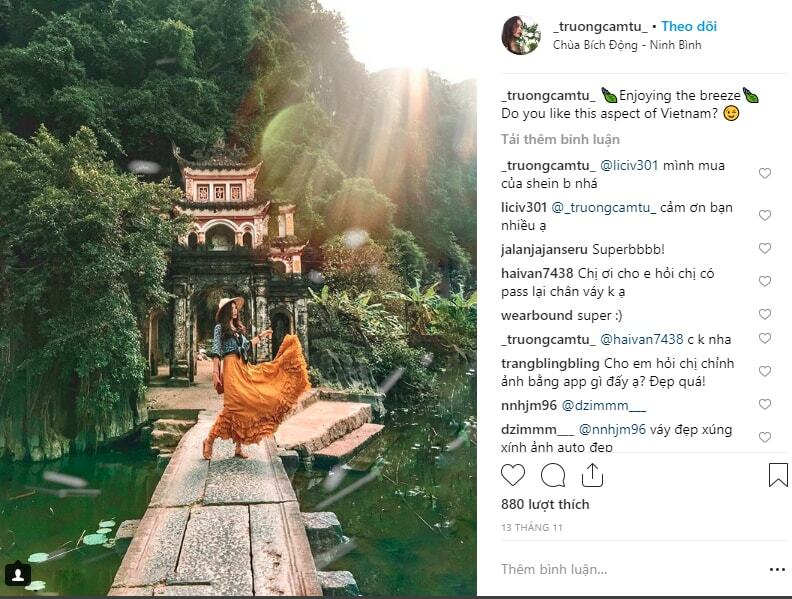 Trang An is the top attraction in Ninh Binh which you can visit first or later but never should skip, for whatever reason. Being a complex of ecotourism zone with a various system of limestone cliffs and karst caves, Trang An boasts bountifulness of biology and geographical diversity. There are hundreds of limestone islands, islets and river caves constructing by Sao Khe and Ngo Dong rivers. Some of them you can’t miss: Dia Linh cave, Sinh Duoc cave and May cave. Each cave is different in beauty and has its own legend. Dark Cave has wide and narrow parts while Light Cave is adorned with magnificent sparkling stalactites. Covering such a vast area Trang An is a biological treasure trove obtaining over 350 species of plants, animals and many other rare species. Taking a boat through 9 caves of Trang An complex and visiting some historical and cultural places on the way are highly recommended. From Trang An, visitors shouldn’t miss Bai Dinh pagoda – the largest Buddhist pagoda in Vietnam with impressive architecture. Tam Coc, meaning Three Grottoes, includes Hang Ca, Hang Hai and Hang Ba, concealing a whole world underground. To visit Tam Coc is to ride a boat following the gentle Ngo Dong River, passing the golden floating paddy fields under the towering limestone cliffs, into the depth of the three caves’ chambers. 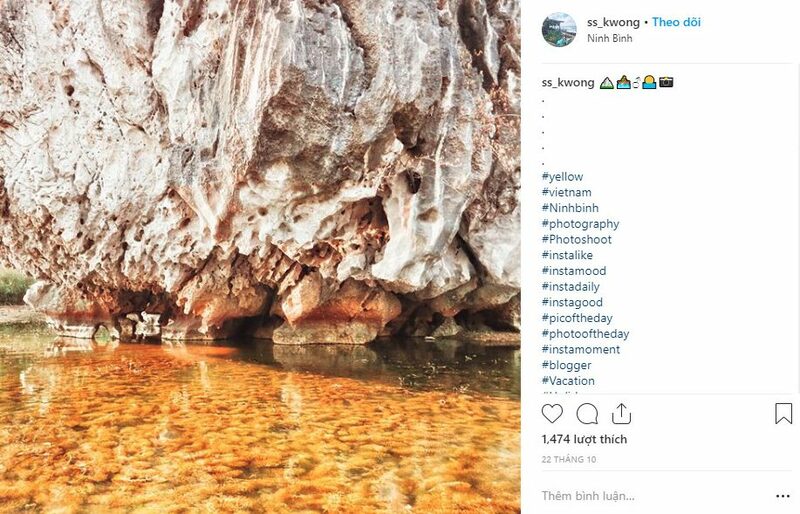 The first cave, Hang Ca, is the largest cave and the most beautiful one with the total length of 127 meters, lying under a limestone mountain towering on the water. 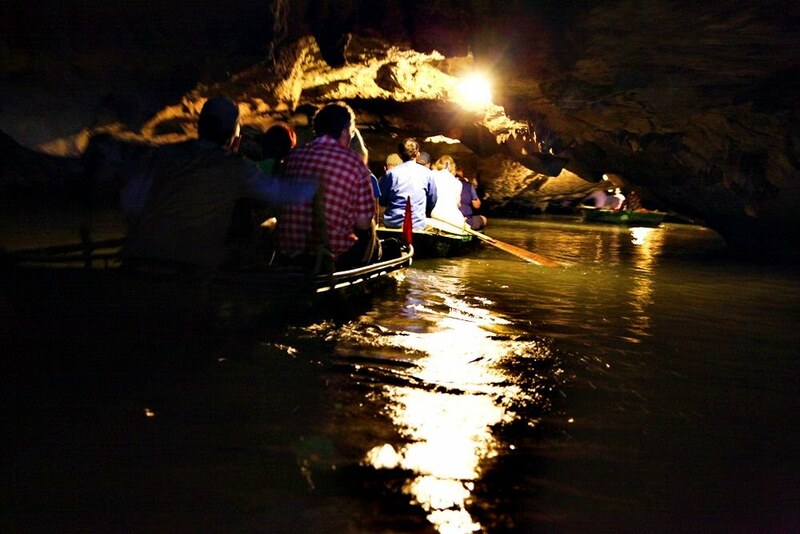 You can’t help to feel the trills when you are going the most beautiful and mysterious tunneling water cave in Ninh Binh. It’s like you’re on a hunt for treasure. Only 2 km away from Tam Coc Whalf, Bich Dong Pagoda is a solemn place where the pagoda entrance was built on a limestone island. Visitor will walk on a thin stone bridge to pass the gate to come deep into the chambers of Bich Dong Grotto – ‘the second nicest grotto’ in Vietnam. Come and find out if the grotto’s beauties really live up to its given title. Thien Huong grotto can be visited on your way to Thai Vi temple. This grotto is wide, located on mountain and looked very much like a colossal lightwell since the ceiling of the grotto is a hole. So it has also another name – Sky Grotto. Thai Vi temple is a place to worship many national characters and heroes: King Tran Thai Tong, King Tran Thanh Tong, General Tran Hung Dao, General Tran Quang Khai and Queen Tran Thi Dung. See Tam Coc in the best time of year with $20 OFF!!! In recent years, Van Long Nature Reserve has appeared on many visitors’ bucket list of Ninh Binh’s top things to do. Vietnamese people has this saying to describe the nature beauty: the mountains and the water found harmony, and that harmony is found in Van Long. Served as a nature reserve with a wide range of fauna and flora species, including the rare species listed in Red Book and one of them are the silver langurs. A boat trip is the best way to enjoy the beauties and the atmosphere of Ninh Binh’s hidden gem. If you are looking for a short mountain trek, amazing panoramic views and photos of dragon on mountaintop, Mua Cave gets to be your destination. 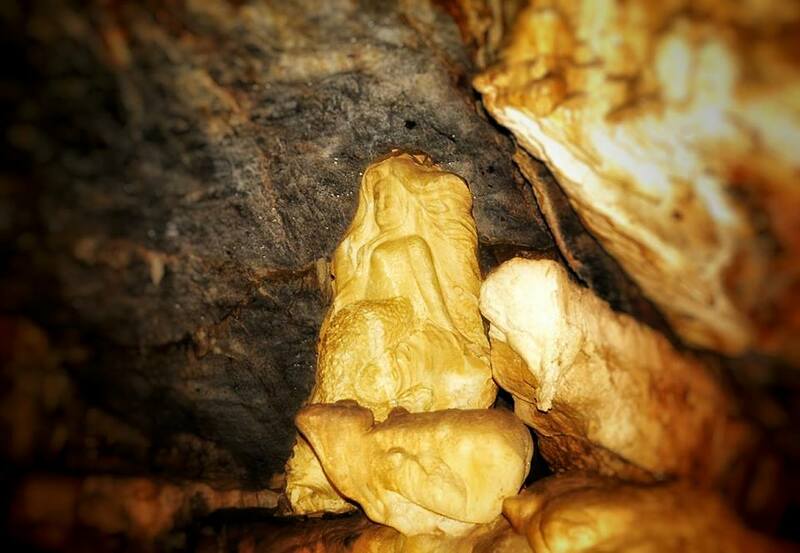 Visit Hang Mua first to enjoy the cool air and the stalactites which are formed in many shapes and sizes. 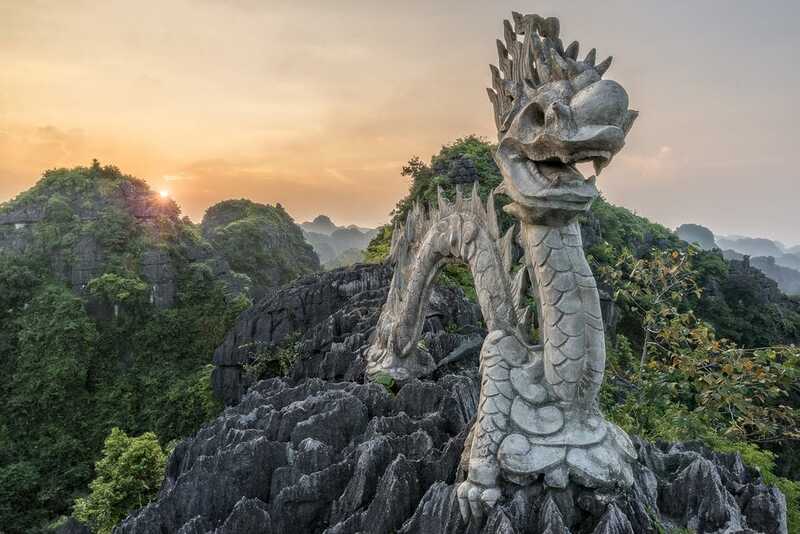 Then trek your way up to the top of Lying Dragon Mountain where a stone dragon statue sits. 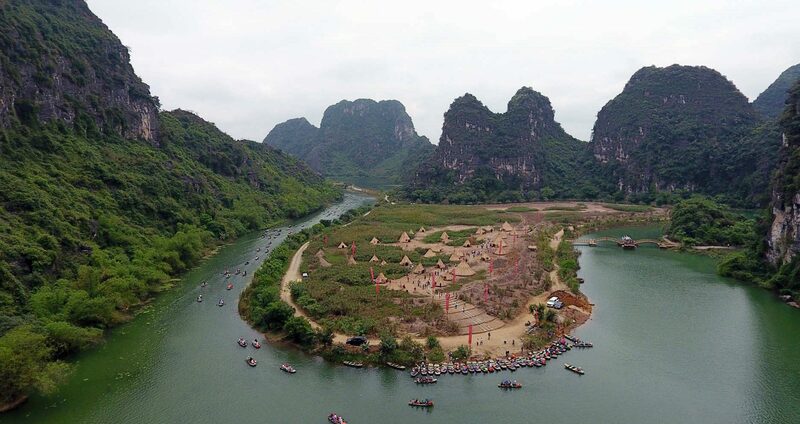 From there, not only you can see a giant dragon stone statue but also can take in the whole view below of rice field being surrounded by limestone cliffs. The boat ride follows the 3-kilometer Ngo Dong river to wander amazing limestone mountains and the three famous caves. If you visit Tam Coc at the right time of the year, the river will be surrounded by golden rice fields on the both sides. From Tam Coc, pay a visit to Thai Vi Pagoda which is just stunning with unique architecture and charming natural landscapes. The costs in Tam Coc are quite high: you’ll have to pay 150,000VND for the fee, including boat fee and caves visiting. 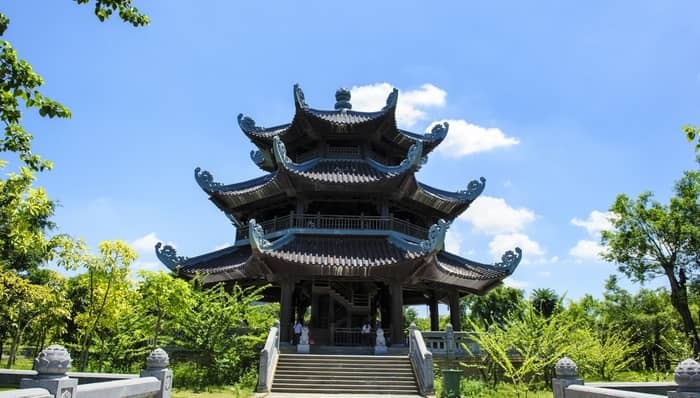 Bai Dinh Pagoda is the largest religious complex in Vietnam covering a total area of 539 hectares, featuring the most dramatic and beautiful backdrop of limestone cliffs and rivers. 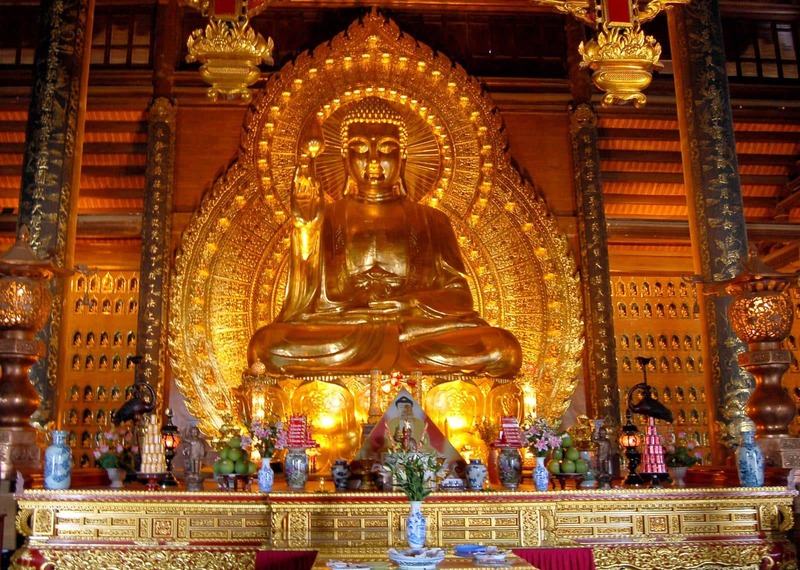 Bai Dinh is dedicated to the worshiping of ancestors, Buddha, Genie Cao Son. Two caves here are Bright Cave and Dark Cave which are also dedicated for worshiping. Inside the pagoda, you can find some really valuable worshiping monuments including a 10m high Buddha Sykamuni statue made of bronze. Each year, Bai Dinh Pagoda temple is also held on the sixth day of lunar first month which is considered one of the most important cultural event in Vietnamese culture. The Wine Making Cave, the cave that appears in legends and myths, can only be accessed by boat. 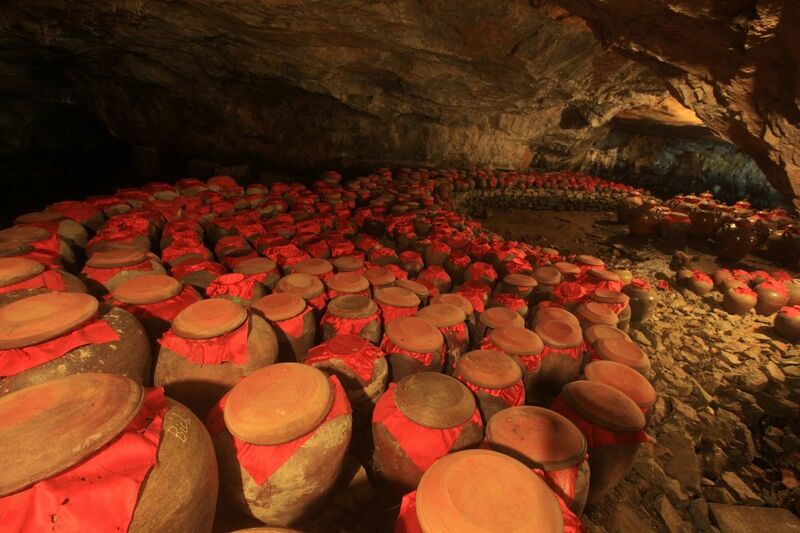 Once you have been inside the cave, the old-fashioned wine containing jars will appear like a little surprise. Legend has it that the ancestors knew there was a 10m-deep groundwater flowing in this cave hence Wine Making Cave became the place where the old folks took the water to make wine for the king. You can visit Wine Making Cave by booking boat tours in Trang An. Besides the towering limestone cliffs, beautiful waterway and caves, Trang An also has beautifully located temples with unique architecture. The backdrop of mountain and water in Ninh Binh adorns them even more. Hoa Lu used to be the ancient capital of Vietnam in three periods of early emperors due to its strategic location. Surrounded by rugged mountains and Hoang Long River, Hoa Lu Ancient Citadel was almost impossible to penetrate by invaders. The visit to Hoa Lu is easy. Trinh Temple has been around for about 1000 years, is located at a foot of a mountain. Thanks to several renovations and repairs, Trinh Temple is even more beautiful and spacious. 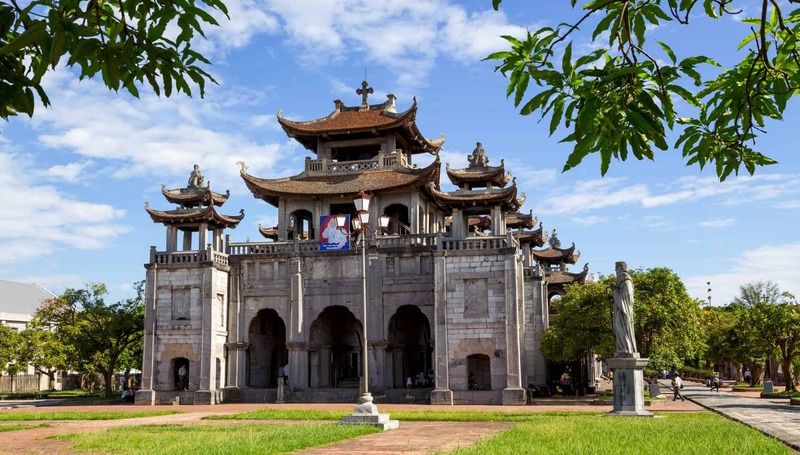 The architecture of Trinh Temple boasts sophistication through its eight roofs and ancient bell “Phu Nghia Tu Chung”. 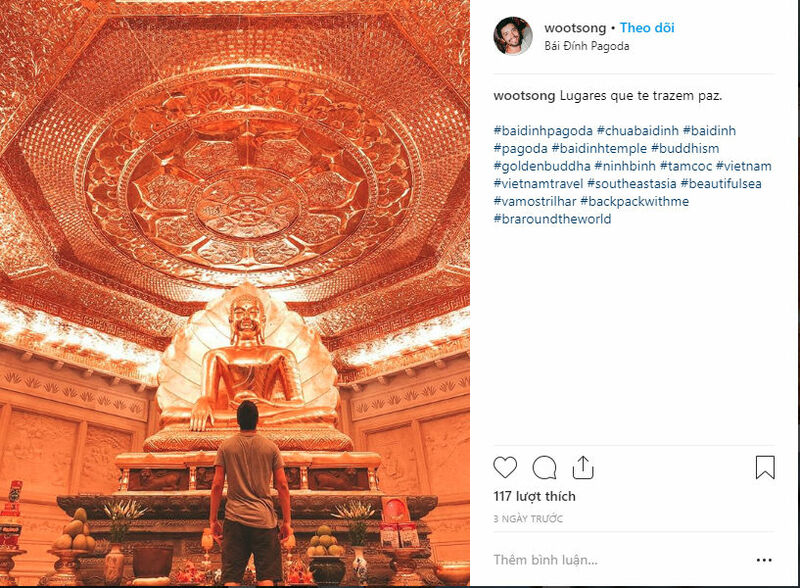 A visit to Trinh Temple should be included in your trip in Trang An. - Wear clothes that cover from your shoulders to knees. Be respectful at the scared worshiping places. - The temples can be crowded, choose something comfortable to wear. - Mind when you speak and walk – talking too loud and making noises while walking are also not appreciated. 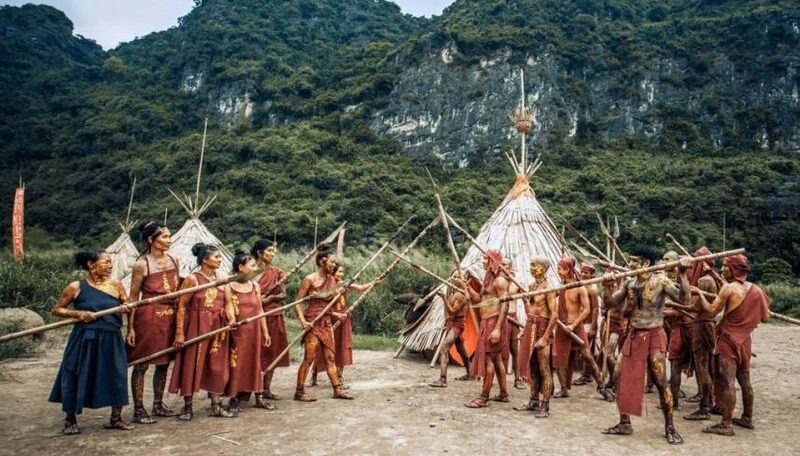 You've watched the filmed and would love to see the film set of this hollywood blockbuster, wait no longer and visit Trang An to live in the movie's alternative universe. The tribal village you've come alive with the rattan huts, tribal people with all the decorative items just like in the film. At this site, you can also find the models of ship and airplane mimicking the movie. 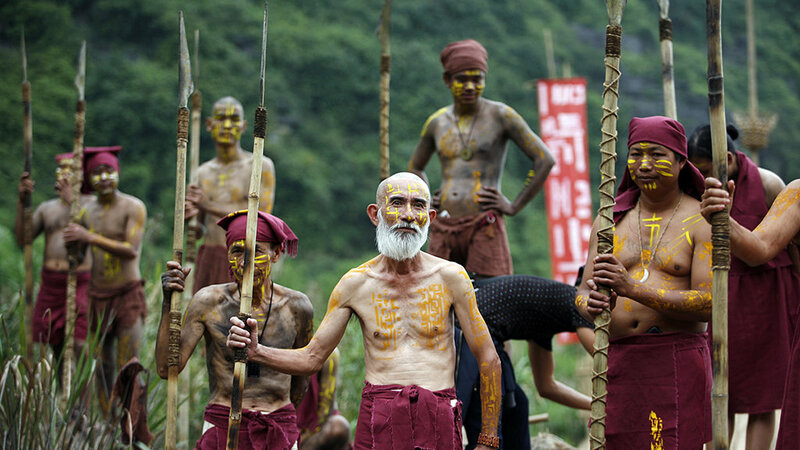 Tribal villagers are role-played by the locals and you can take photographs or selfies with them. 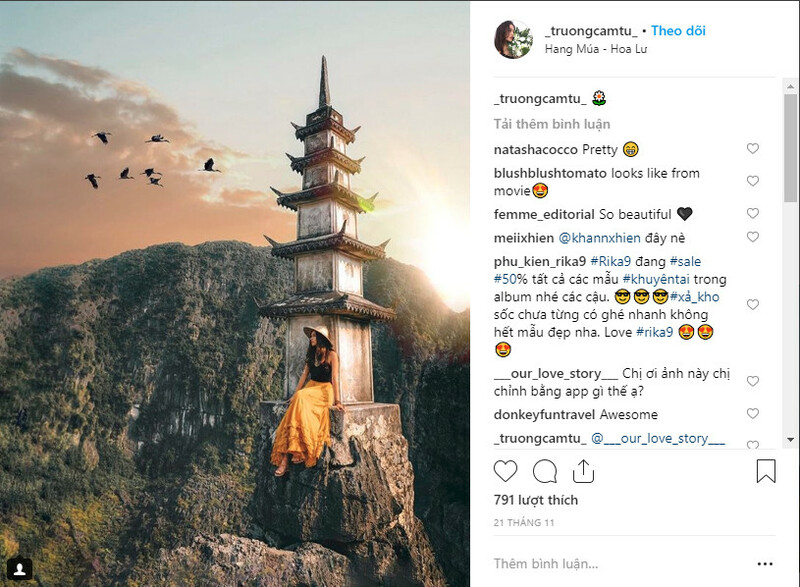 With the magnificent backdrop of Trang An landscape, this village makes a unique places to produce impressive photo for your Instagram posts. 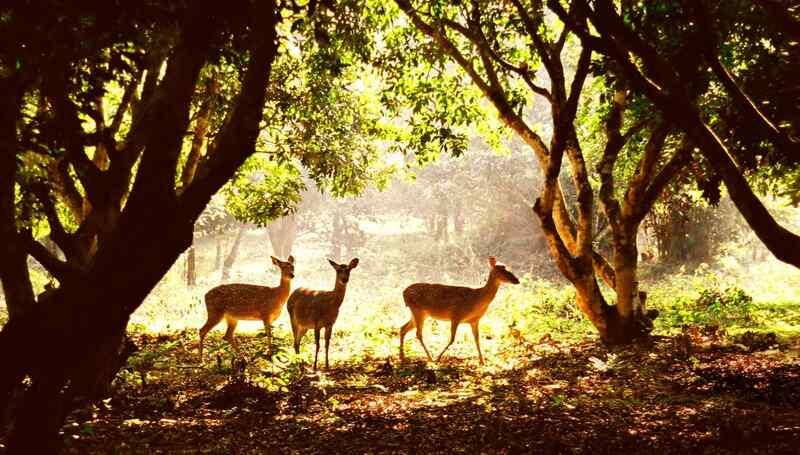 Cuc Phuong is the most famous national park in Vietnam, also the oldest one and the largest nature reserve, spreading out on three provinces. What you can find in this paradise of wildlife are limestone mountains with hidden caves, thousand-year trees and lush valleys. Cuc Phuong is home to a biodiversity of flora and fauna, including 97 species of mammals, langurs; 300 species of birds, 11 species of fish; 2,000 species of vascular plants, and thousands of species of insects. To visit Cuc Phuong National Park, you'll have to pay 40,000VND for admission. Firstly you'll come to the Endangered Primate Rescue Center which is responsible for rescuing individual animals of rare primates and home to over 140 creatures and 100 offsprings in all from 15 species of gibbon (long-armed, fruit-eating ape), languor (long-tailed tree-dwelling monkey) and Lories (smaller nocturnal primate with large eyes). The second stop is Prehistoric People Cave - the place where ancient people were living 7500 years ago. 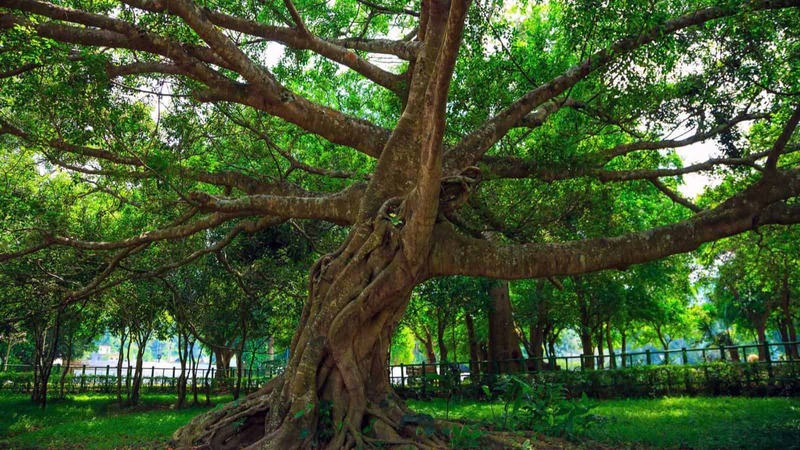 The most special feature of the park is the 1000-year-old Cho Tree with a diameter of 5.5m. Son Cung Cave and 648-m Silver Cloud Mountain are the slightly more challenging options for your trek. A visit to this nature paradise offers you chance to see a wide range of flora and fauna, caves and hot springs. You’ll be surrounded by a quiet atmosphere, fresh air – it’s literally the best escape from city life. If you want to camp, rent in advance (from Hanoi) tents and necessary equipment. Ninh Binh has very beautiful and peaceful rural area. A bike tour will take you to paths in the rice fields where you can see the cows roaming free. The local villages are the place to feel the friendliness of the people, especially the children. It’s just wonderful experience to see where people live, work and their daily life. Thung Nham Bird Garden is home to about 40 species of birds – a truly hidden gem in Ninh Binh which is still underrated. Tucked away in the limestone cliffs, Thung Nham sees most of the birds in the region coming to make their nests. Thung Nham is located near to Tam Coc, often missed in the list of tourists to Ninh Binh. Come to the garden, not only birds here that you'll have chance to see but also an impressive hidden Mermaid Cave and peaceful landscapes. Mermaid Cave or Dong Tien Ca is a flooded cave deep under the ground. A beautifully made stone stair will lead you down and around the cave. Visitors coming to Thung Nham will have chance to see all types of the birds gathering on the tree branches – a truly wonder of nature to behold. Phat Diem Stone Cathedral is considered the Catholic capital in Vietnam, well-known for its very special fusion of Western and Vietnamese architecture styles. The construction of Phat Diem Cathedral took total 24 years, with the stones of the cathedral were taken from the very limestone mountains in the region. 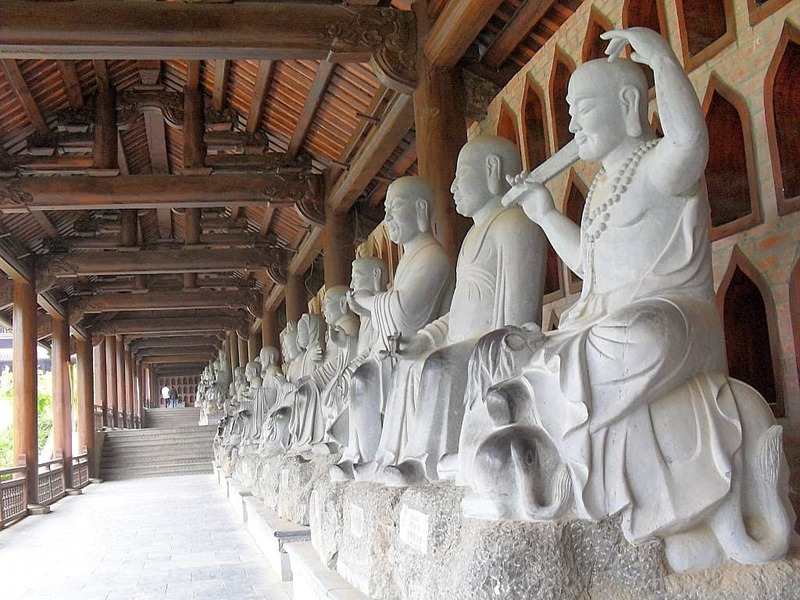 Phat Diem cathedral is a complex included a cathedral, a stone church, a lake, a bell house, and 3 artificial grottoes. The bell house which in Vietnamese is called Phuong Dinh is a 3-level building and completely made out of stone. On four towers of the bell house stand 4 statues of 4 historical saints which are imprinted of Vietnamese architecture characteristics. The cathedral and the bell house are designed with much similar to traditional Vietnamese pagodas and temples. This is the national-wide famous Ninh Binh food which is loved from north to south. This dish is mostly made from burnt rice topped with Rousong (meat floss), or pork, beef or onions. Larger rice crust is cut into smaller pieces. To make this dish, the chef will prepare dried rice rounds and when orders come, he will just fry them until crispy with sesame oil. Lastly, vegetables, beef or pork will be put on the rice; and bowl of sauce will be made to use with this dish. Unlike Com Chay, Mien Luon (Eel Vermicelli Soup) is not as well-known but just as tasty. The soup's broth is quite dark because the eels were simmered for a long time. The eel meat is spiced thoroughly to enhance the flavors of the dish. This soup best to served with a lot of herbs. Nem Chua Yen Mac (Yen Mac fermented pork roll) has its name recognized for a long time ago. To make this dish, a secret recipe is required with a lot of efforts and passion. The rolls are fresh, lightly sour, used with herbs and sauce. Ninh Binh is just south of Hanoi, just 90 kilometers away from the capital of Vietnam. This convenient location makes Ninh Binh the wonderful destination to visit within a day. You can possibly make a quick tour in north Vietnam from Hanoi to Ninh Binh and Ha Long for 4 days and 3 nights. You might find it an interesting experience when you have chance to compare the two world’s heritages Ha Long and Ninh Binh which is also called by the nickname ‘Ha Long Bay on Land”. Located just about 90 kilometers south of Hanoi, Ninh Binh is the southernmost gateway of the north and Red River Delta region. This location makes Ninh Binh a perfect destination for a day trip to escape Hanoi. It’s not all. Due the benefits of its climate, almost any time of year is suitable to visit Ninh Binh. By train, you can reach Ninh Binh city with 3 southbound trains available which are SE5, SE7, SE19. Hanoi buses to Ninh Binh depart at Giap Bat bus terminal , with prices starting at 70,000VND. It takes about two hours. Or you can drive a motorbike by yourself which is considered most dangerous and time-consuming. If you’re not experienced with riding a motorbike, we recommend you not doing so. If you prefer even more convenient transportation options, you can book tour with a travel agency or a tour operator. It’s safer, faster and more enjoyable. 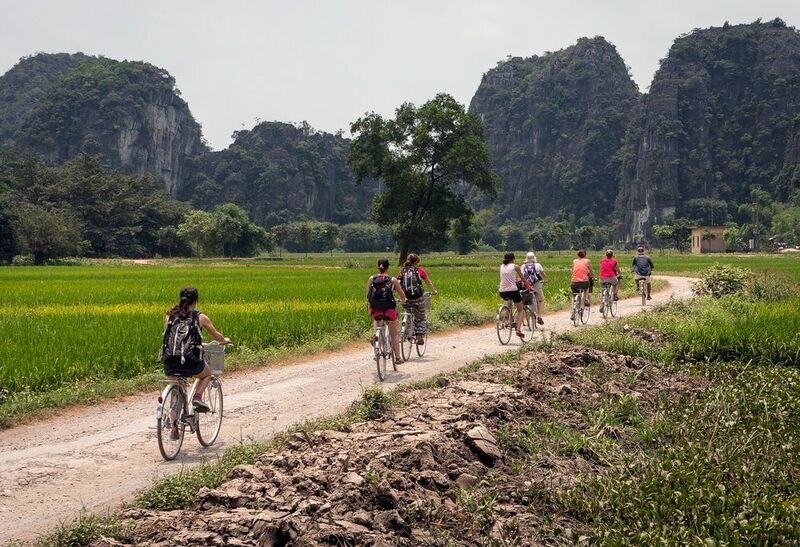 We've shown you all the worthy things to do in Ninh Binh together with all practical information to help you get the most out of your Ninh Binh experience. Need more? Or contact us to request a Ninh Binh tailor-made tour.